Ellen Mayer of Chester has enjoyed an incredible amount of luck in her life. When she was only 18, just out of high school, she was waiting in line with more than 50 other people, portfolio in hand, to be interviewed for a job in fashion. She was on her lunch hour, and figured she had nothing to lose. She was asked to illustrate something — and, just like that, she got the job. 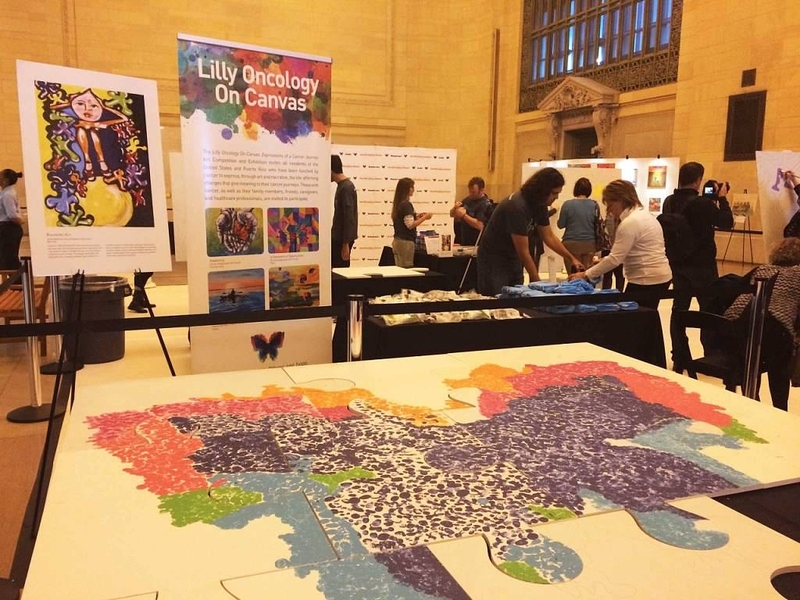 More recently, the bubbly Bronx transplant won the Lilly Oncology on Canvas Art Competition with a painting brought to life at a special event held Oct. 23 in the Vanderbilt Hall at Grand Central Station. 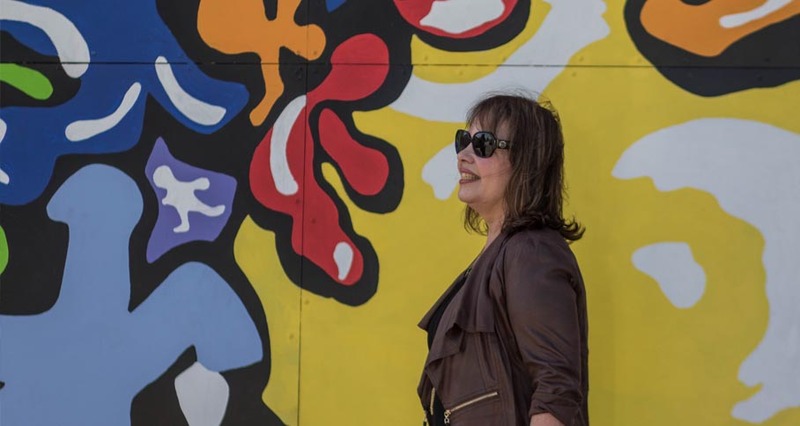 There, four designers, 60 paintbrushes, 10 gallons of paint, and a whole community transformed her art into the giant New York Hope Mural, an expression of hope in the face of cancer. “I got there five minutes late in the pouring rain and traffic," she said. "All these people were waiting for me to do the first stroke before anybody else could begin to paint." She was then whisked off to be interviewed by such news icons as CNN and Times Business. Everyone waited while she dried her rain-drenched hair. It made her grin to hear “Take one!” and “Take two!” from the videographer. As she walked to and from the many different events she was obliged to attend, she regretted her decision to wear heels that day. But she enjoyed being treated to lunch, staying with her husband in a hotel, and attending the gala dinner. 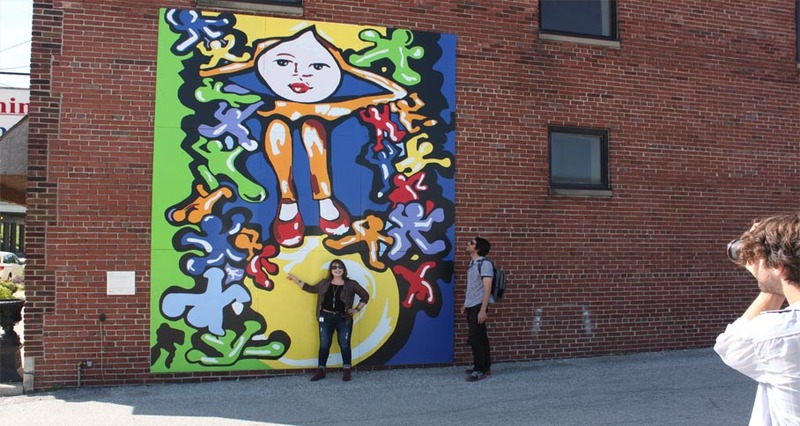 Mayer's mural was completed through a paint-by-number transfer on large panels worked on three at a time and later assembled. She was surprised to see so many people lining up just to paint a few strokes. But those strokes will be part of history, embodied in a permanent work in a permanent New York City location. Mayer said anyone who has been affected by cancer, either directly or through someone they know, can submit artwork to the Lilly Oncology on Canvas Art Competition. 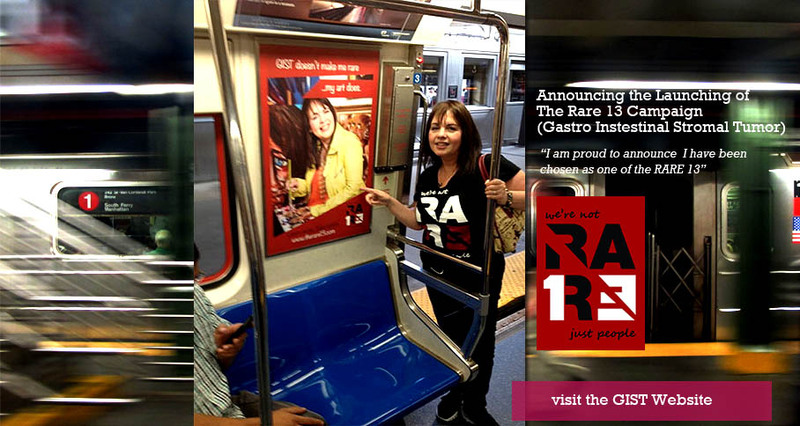 In 2010 and in 2012, her paintings in oils and acrylic traveled around the country and throughout Puerto Rico. Here's another example of Mayer's famous luck — she survived a very rare form of cancer called gastrointestinal stromal tumor, or GIST, which affects the digestive tract. 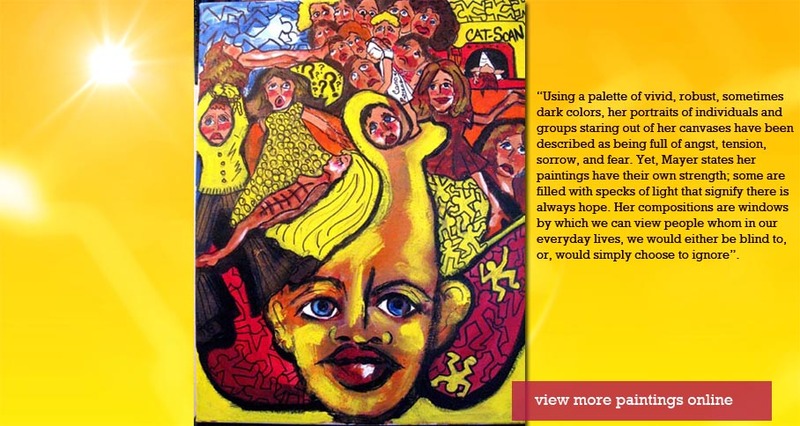 Mayer called her winning mixed media painting “Balancing Act." It depicts a female figure balanced on a bright yellow ball, her hands on the sides of her head. Abstract figures appear in vertical lines on either side of the central figure, whose expression is one of peace. For ten years now, the Lilly Oncology on Canvas Art Competition and Exhibition, presented by Lilly Oncology and the National Coalition for Cancer Survivorship, has brought to light the journeys people take after they receive a cancer diagnosis. To celebrate the 10th anniversary of the competition, the Hope Murals Project transformed 10 pieces of art from past competitions into 10 murals in 10 cities across the United and Puerto Rico. Mayer's work was chosen from among the thousands submitted. Nine other artists will be honored in nine other major cities. The New York Hope Mural painted in Grand Central Terminal was presented by Lilly Oncology and the National Coalition for Cancer Survivorship, with CancerCare and the Herbert Irving Comprehensive Cancer Center of Columbia University and New York Presbyterian Hospital. They intend to build a national community art movement. The three national winners of the 2014 competition were among the hundreds of painters who gathered at Grand Central. More than 100 entries from the 2014 competition were on display. Mayer describes her work as having “intense, swift strokes of strong dark colors and textures with quick motion and layering of paint, inspired by the feelings of motion and emotion.” Max Beckman's bold black outlines and Edvard Munch's intense emotions “translate the true depth of my feelings about contemporary issues," she said. 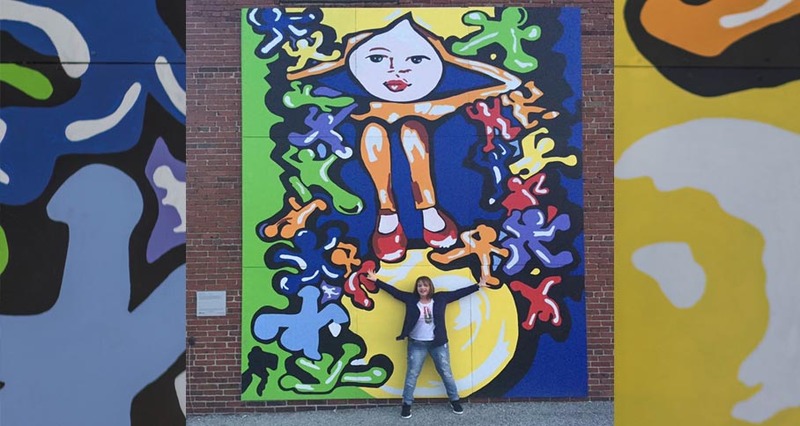 The mural had to be painted twice to make the colors as bright as they could be. It will be transported back to Indianapolis for final touch-ups and highlights, then placed in its final location.